Perfect for summer & winter ski vacations, only 20min from Gourette ski station. This beautiful & spacious converted stone barn with large log burning fire, has it's very own breathtaking views from every bedroom window. Exposed wooden beams & stone walls in master bedroom and bathroom, recently updated to provide a comfortable and relaxing environment. Sunbeds are provided and teak table & chairs to enjoy bbqs & al-fresco dining in your very own secluded garden. Traditional French style kitchen equipped with: fridge/freezer, microwave, range cooker, dishwasher, iron & ironing board, crockery and utensils + kettle, coffee maker,and toaster. Living/dining area with wood burning fire & huge oak dining table to seat 10-12. Sumptuous leather sofas, TV, DVD player. 5 double bedrooms, with 3 additional single beds for twins. 2 bathrooms/WCs with separate showers. Billiards room & indoor table tennis, Xbox and games. 1 downstairs WC + washing machine. Hiking and Cycling: The area is perfect for hiking and cycling holidays in Tour de france territory over the col D’Aubisque and the portalet and Marie Blanc the house is also excellently located for hiking holidays whether it's taking part in the GR10 we are located close to the Chemin de la mature and near to the Pic du Midi d'Ossau and surrounding lakes. Both bathrooms have been refurbished up to a high standard. a fantastic house, fabulous location, all the tips and recommendation you could ever need; basically a perfect holiday. It truly was a home from home and we didn't want to leave. Our three kids loved the garden, games room and mountain hikes - they could have fun, charge about and basically be children. The Laruns swimming pool was brilliant as were the suspended forest, vulture sanctuary and the petit train. There were a dozen more things to do which we didn't get to so we'll save those for next year! If you are reading this wondering whether to rent it then the answer is definitely yes. Its a big house with tons of beds, beautifully presented throughout with loads to do. We went in the summer and I'm sure its even better in the snow. maison vaste et agréable à vivre. Cette maison est très agréable à vivre et au grand calme. Sa pièce de vie et sa cuisine sont grandes et les chambres à l'étage sont belles et lumineuses. Nous étions 8 et avons chacun trouvé notre place sans se marcher les uns sur les autres. Nous avons eu une belle semaine ensoleillée, la terrasse a été appréciée de tous à chaque repas. Tout d'abord, une situation idéale, au calme, près de Laruns sans en avoir les inconvénients, et une vue imprenable sur le pic du Ger! Nous avons particulièrement apprécié la salle à manger très spacieuse (nous y avons mangé à 12 sans se gêner), la salle de jeux pour les enfants qui assure la tranquillité des parents, le grand jardin dans lequel on peut garer plusieurs voitures, la literie très confortable. Le petit plus, une déco sympa, bref, on se sent presque chez soi et on a envie d'y revenir! 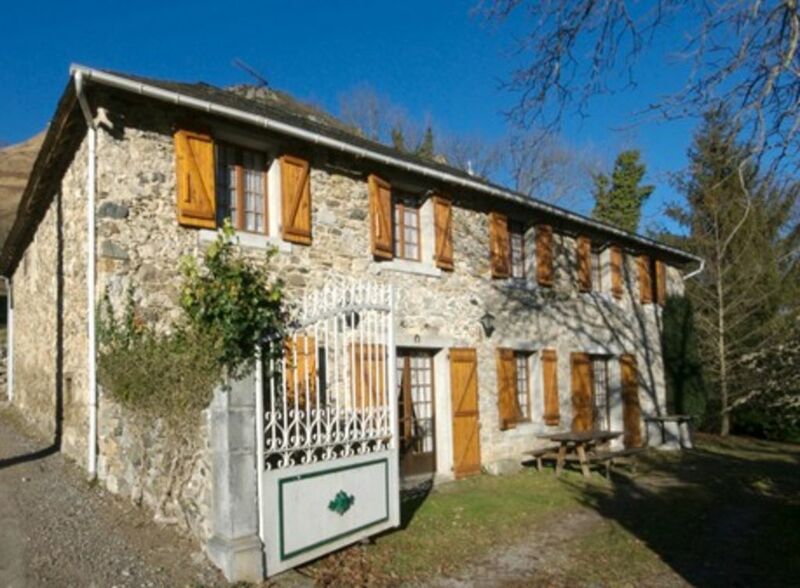 La maison se prête parfaitement à des vacances à plusieurs familles (nous étions 4 couples et 9 enfants de 1 à 4 ans). Les 5 chambres sont bien meublées avec du rangement. Les gros points positifs: la salle de séjour, immense et agréable, avec une grande table pour les repas; les 2 salles de bains spacieuses. Bonne situation géographique: de nombreuses randonnées et activités à proximité, commerces à 5 minutes à Laruns. région magnifique, grande maison (malgré un nombre important 15), personne ne s'est gêné. Parfaite situation, prés de Laruns, pas trop loin des pistes de Gourette, et des promenades en raquettes sur le cirque de Haneou, nombreuses promenades sur place sans prendre sa voiture, visite des fromageries et des vieux villages environnants. The house is a short distance from Pau Airport with flights from London/Bristol, situated on the edge of the Ossau valley in the heart of the Pyrénées 20 mins from Gourette ski station and only 40min from Formigal ski station, 90min drive from the beautiful beaches of Biarritz, 5min from the lovely market town of Laruns. Col D’Aubisque and Portalet to name but a few! Highest Steam Train in Europe (Artouste). Other Activities: Skiing 20 min from house. With 28 downhill runs, the steepest of which at Pene Blanque offers experienced skiers some exciting thrills, red and blue, wide and fast runs, Gourette caters for every kind of skier. 40 hectares are given over to beginner. There are specially equipped nursery slopes with ski lifts and travelators, as well as an international ski school. For a complete experience on and off the slopes, the modern, stylish ski resort of Formigal is the perfect choice. Formigal is the largest and most complete resort in all of Spain, boasting 137km of slopes. Ideal for the beginner and expert skier alike, for snowboarders and skiers. 50% to confirm booking, outstanding balance to be paid 1 month prior to arrival. There is also a €400 deposit to be paid in cash/cheque for breakages and damages, this will be returned after satisfactory inspection. Electricity is charged separately at the house, a meter reading will be taken at the start and end of the stay and charged at 0,10 per kw at the house.